expect the unexpected, because life with an eight year old boy in the house is a non stop adventure. And yes that is what it looks like. 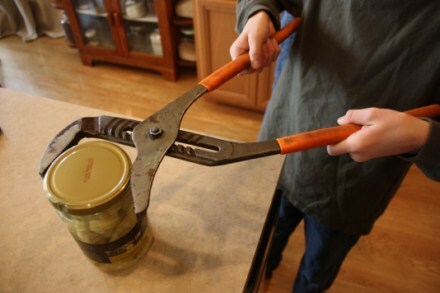 Isn’t that how everyone opens a jar? Awesome…mine just turned 8 a week ago. I guess I should start expecting the unexpected too. HA! Ha ha! I am here to tell you it’s not much different if it’s a 4o something year old man and he’s a dairy farmer! We have a pair of channel locks in the drawer next to the refrigerator for just that purpose! 🙂 I like your son’s method. 😉 I’ve found that putting a thick rubber band on the lid and then turning usually work just as well though … most of the time. Finally, as the mother of soon to be 23-year old son, I’ll tell you that the adventure is just beginning. 8 is a very good age! That’s the same tool 2 23 year old “boys” removed a wire from a partially frozen turkey for me once. They don’t outgrow it.